FREE ANGELA AND ALL POLITICAL PRISONERS might seem like a cumbersome title but it rings with truth and historical significance to all those who continue to be inspired by her fight for political and racial justice. As a woman of colour living in a city that is far from repressive, I am always aware that I benefit from the struggles of the civil rights movement, and of the urgent need for the younger generations to be reminded of, and inspired by, the victories of the 1960s and 1970s. This exceptionally well made documentary, by writer-director, Shola Lynch, goes a long way to answering that need for a definitive record of Angela Davis' central political struggle: her rise to notoriety when the Regents of UCLA sacked her for being a Communist, and her trial for murder, kidnapping and conspiracy, when guns she had bought in self defence were used by others in an attempted kidnapping of a judge. The charges were, of course, ludicrous. Why would a woman of profound intelligence - an Assistant Professor of Continental Philosophy be so dumb as to use guns bought in her own name in a kidnapping. And as Davis pointed out in her own opening statement in her defense, there is a deep vein of male chauvinism in the idea that an hysterical woman would commit a crime of passion to free the man she loved - as if woman are irrational objects unable to govern their emotions. The documentary benefits from complete access to all the prominent people in the trial, not least Angela and her equally impressive sister. There is something still resonant and powerful in hearing two such eloquent women arguing intelligently for civil rights. Shola Lynch also makes good use of the extensive archive footage of Angela's UCLA case, and reporting of the trial, as well as the subtle use of recreation to give us an idea of certain key emotional scenes when Angela was on the run, and then incarcerated. The most surprising thing for me was that two heroes emerged from this whole era of repression in the most surprising places. The first is the white farmer from a conservative town in California, who put his farm up as bond for her bail on the grounds that freedom of speech is part of the American way of life and must always be defended. The second is the white judge who casually describes his act of courage in deflecting all the political pressure to use this chance to essentially rig the trial at a time when the three charges Angela was facing all carried the death penalty. 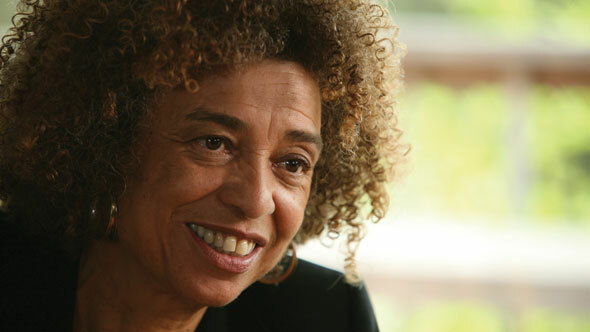 FREE ANGELA AND ALL POLITICAL PRISONERS is an important and complete record of a key event in the civil rights struggle. One can only hope that it gets the audience it deserves. FREE ANGELA AND ALL POLITICAL PRISONERS played Toronto and London 2012.